Do you buy the large, 32-ounce yogurt containers? Good for you. You know that it’s much more economical and environmentally friendly to buy the biggest container you can rather than the single-serving s. But now, what do you do with the empties? Many people can recycle the #5 plastic containers, but there’s so much more you could do with them. Read our tips for decorating, reusing and upcycling these useful containers. While you can reuse a clean yogurt container for other food, you want to make sure you don’t confuse it for the real carton of yogurt in your refrigerator. Be sure to label the new contents by adding a mailing label, piece of masking tape or writing directly on the container with a marker. If you want to clean off the printing on the container, the easiest way is to use acetone-based nail polish remover and a cloth to rub it off. It may take some elbow grease to get it all off. Cover the outside of the container quickly with colorful duct tape or adhesive-backed scrapbook paper or drawer liner. Paint the container with spray paint or chalkboard paint. Add stencil decorations or use chalk to label the contents. Use a thin white glue to adhere fabric or paper to the container. From there you can also add ribbons, buttons and other decorations. Once you open a bag of dried beans, popcorn kernels or rice, pour the contents into a large container (or two) rather than keeping the bag in the pantry, which can easily spill and attract pests. This tip works for the freezer as well. After you break open a bag of frozen veggies, pour the rest in a container to keep your peas, corn and broccoli from getting freezer burn. These containers also make useful freezer containers for stock, soup or leftovers. Use the containers to send leftovers home with friends after dinner parties. This way you don’t have to worry about getting a plate or bowl returned to you, and your friends have a lidded container that won’t spill in the car. Poke holes in the bottom, add soil and a few seeds to create a window herb garden. Place the lid underneath to catch water. Cut a slit in the lid to collect Box Tops for Education or other labels you’re collecting for school fundraisers. Forget buying gift bags or wrapping paper; instead, place your small gift inside a beautifully decorated yogurt container. This idea can be used for both food and non-food items. Create camping kits with the containers. Ideas include: silverware and sharp knives; a sponge, cloth and dishsoap for washing dishes; and different batteries for flashlights, lanterns and the air mattress pump. Put together a first aid kit for the car that includes bandages, antiseptic ointments, disinfectant wipes, tissues, plastic bags, tweezers, aspirin and anything else your family might need. Take a few containers to the beach. Use them to make sand castles and collect shells. 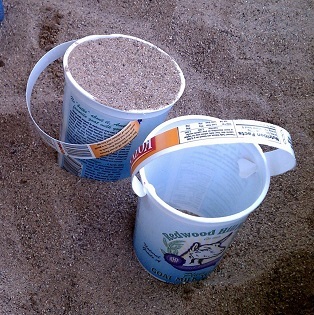 Create a bucket with a handle to make it easier to carry water or sand. Add a slit in the top to make a piggybank. Consider making three piggybanks, one each to collect money for saving, spending and sharing. Keep the lid on to create drums for little hands to pound on. When the kids are done pounding, they can use the containers as building blocks. These blocks are so light they won’t hurt the kids, furniture or the dog when they come tumbling down. Use them in the bathtub, either as scoops for playing with the water or rinsing out shampoo or to corral small tub toys. Store kids’ collectibles in the containers. Kids collect things – interesting rocks they pick up in the yard, plastic prizes from parties, doll accessories, pencils and erasers – and these containers allow them to keep the collections in check. Invite kids to decorate containers at your next playdate or kid’s birthday party. After guests decorate a container, they can fill it with goodies.